Ocho Rios holiday resorts are located along the north coastal waters, where you will find some of the best beaches in Jamaica. Most of the hotels & villas in Ocho Rios have their own private beaches where you can relax in peace and comfort. You can just laze away the time soaking up the sun, sipping one of the potent Jamaican cocktails, sampling some of the great Jamaican cuisine and enjoy a good massage and spa treatment. You can do as much or as little as you like on your holiday in Ocho Rios. The tranquil and beautiful surroundings of your hotel will help you forget about work and help you to relax. Most of the hotels & villas beaches in Ocho Rios, sits within the Ocho Rios Marine Park. This mean you will be able to enjoy well maintain beaches surrounded by lush vegetation, that will make you feel right at home. 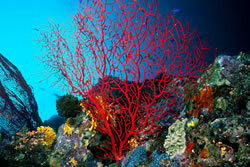 The marine park give protection to the marine life within the park including marine plants, coral species and fish life. Because the area is protected we have a vibrant marine ecosystem that have been allowed to florist in their natural environment. This mean an abundant of various fish and coral to see on your glass bottom boat trip. Your glass bottom boat trip take you from the dock in Ocho Rios out to one of the popular coral reefs. Where we will slowly cruise along the reef giving you a chance to see all the various fish and corals through the windows in the bottom of the boat. Our guide onboard will walk you through the the seascape below and happy to answer any question. Once we finish your viewing at the reef we will give you a coastal scenic tour on our way back to the dock. You can see some of the many beautiful hotels & villas, private homes along the coast and hidden inlets. You will be able to enjoy the beautiful views of the hills surrounding Ocho Rios including Murphy Hill, Ocean on The Ridge, Fern Gully gorge, Shaw Park Garden and Columbus Heights. Along the coast you will be able to see some of the main beauty spots (depending on which reef you will be visiting) including Dunns River Falls Beach, bottom of the Dunns River Falls, Ocho Rios Bay, Shaw Park Bay where the White River meet the sea et. We offer pickup and drop off for our Glass Bottom Boat trips from the following Ocho Rios hotels and villas. We also pickup from other holiday properties not listed here, just ask when you make your enquiry.